Small prairie No 5542 is one of my very favourite engines and on Saturday I was out with her on the GWSR’s Santa trains. I still haven’t passed out as a fireman (bit of a slow learner on this stuff…) but I had a good go ‘on the shovel’ on the last trip and enjoyed the firing as we blasted back from Cheltenham, having deposited the happy families back to their cars. By then it was dark and some different challenges presented themselves to a novice like me, the most problematic being that when you have gazed in through the firehole door to see where your next shovelful should go, you then can’t see where the black stuff is on the floor of the cab that you want to shovel because your eyesight has gone to pot! I was taught a useful tip here which is that you should look at the fire with one eye closed and that allows the other eye to peer through the gloom and see what you are doing! But ‘The Santas’ are a lovely experience for everyone. When my kids were small, a whole gang of us used to go to the SVR every year (even years after the children started to develop quite strong doubts about the verifiability of the whole Santa thing!) It’s just that the atmosphere is so special and beats your average Debenhams into a cocked hat. It is cold so the platform lights, the swirling smoke and steam is highly atmospheric and so much so that the annual trip to a Heritage Railway to go on the Santa Specials is now almost as much part of the British social calendar as Wimbledon and the Cup Final. 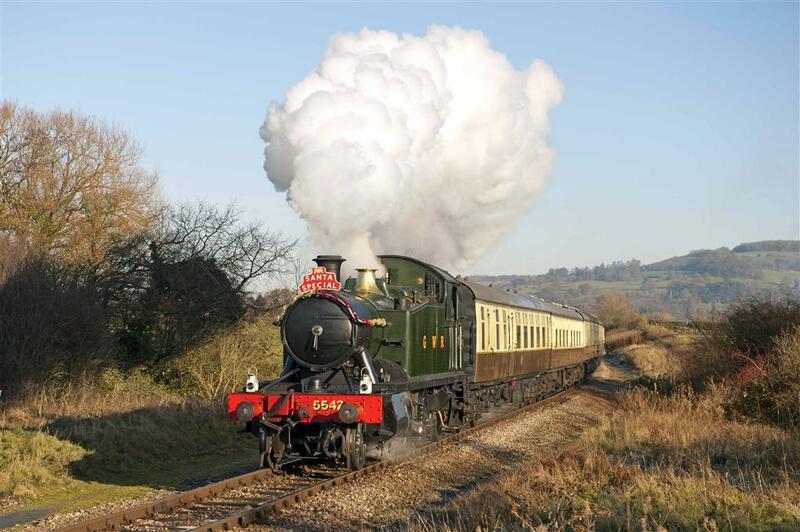 What finally embedded steam trains in British family consciousness was Harry Potter and we should all thank J K Rowling daily (and 5972 Olton Hall, of course) for helping to create the magic of steam for young children and their families. Ok, it’s a long and physically tiring day for the train crews and you start to flag when it comes to cleaning the smokebox and raking out the ashpan after 12 hours on duty but I never, ever go home afterwards feeling that I wished I had done something else that day. During the quite long layovers between trains yesterday, we sat in the cab and chatted, putting the world to rights and musing over various items of railway politics but we agreed that it must have been a wonderful life back in the day when as a crew on a 55xx, you could potter around the branches of the Cotswolds, visiting small goods yards to pick up or set down a wagon or two. 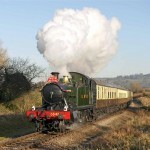 Or maybe hauling a B set, all stations to Shipston on Stour from Gloucester. I know you can get over romantic about those days but I still think it must have been a job to kill for! Are we envious of the guys who did that? Yes, very, but aren’t we so lucky that in 2014, 50 years after the end of WR steam, we get to have a go on a gorgeous little engine like 5542 just as they did all those years ago?